New Micro VHF duplexer with "N" connectors. This unit is tunable between 155-175mhz. 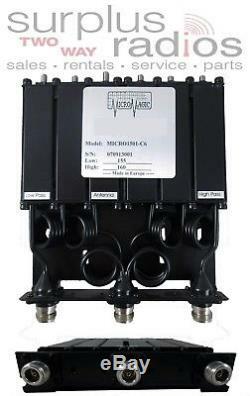 Compact duplexer MICRO-1501-C6 is meant to provide frequency isolation between transmitting and receiving channels. Combining small geometry with low loss and close frequency spacing with selective pass characteristics this duplexer is ideal for use in systems with low-to-medium power repeaters where small physical dimensions of equipment are critical. The duplexer is capable of working continuously at up to 50 watt of power level. The duplexer is tunable within the operating frequency range. & 22-30 (for frequency range of 145-175). Motorola repeaters: GR1225 GR500 CDR700 GR300. Please refer to the return section of this listing for details and eligibility. Most of our items are in stock. We are proud of the fact that we get 99% of the orders to our customers within 3-days. We are an authorized two way radio dealer with a retail location in Orange County, California. We are here to provide each customer with first class service. We strive to ensure our customers are 100% satisfied. Thanks for viewing this listing! Please view our website for more great deals! The item "MICRO VHF 155-175MHZ 50W REPEATER DUPLEXER N CONNECTOR MOTOROLA GR1225 GR500" is in sale since Thursday, July 18, 2013. This item is in the category "Business & Industrial\Facility Maintenance & Safety\Surveillance & Alarm Equipment\Two-Way Radios". The seller is "surplusradios" and is located in Santa Ana, California.